A plasma mortar is mounted on the top of the Wraith. The plasma mortar is a plasma-based Covenant artillery weapon. A bolt of a Plasma Mortar. The plasma mortar fires huge bolts of superheated plasma, which arc in a parabolic trajectory and explode violently upon impact. The weapon has a relatively slow rate of fire. It is extremely powerful, usually killing infantry in a single hit and can destroy just about anything on the battlefield in a minimal amount of shots. While composed of superheated plasma, the projectile fired by the mortar appears to have very high mass, allowing it to simply arc over obstructions such as barricades and hills which can be effective in ambush attacks. The plasma bolt can be out-maneuvered easily by a fast vehicle such as the Type-32 Ghost or Mongoose. The mortar is very effective against dug in enemies, which can deplete the amount of resistance the Covenant ground troops are going to have to face in battle. The Wraith's plasma mortar serves as an excellent long range bombardment style projectile. The arching projectiles allow the Wraith to stay at a particular position, without the worry of having to aim projectiles around and over terrain. In the Halo novels, the physical effect of plasma weapons result in extreme heat and the melting/boiling of enemy armour. This effect is never shown in the Halo games, with the plasma having an explosive reaction instead. The Type-26 35cm Directed-Energy Mortar (T-26 35cm DEM) is the primary armament of the Type-26 Wraith. The Wraith is essentially a mobile plasma mortar. In Halo: Combat Evolved, that was the sole purpose of the Wraith, lacking any other weapon systems. In Halo 2, the Wraith was armed with two plasma cannons for protection. 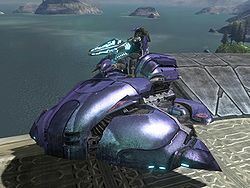 In Halo 3, the Wraith was turned into an all-out tank with its own gunner seat. It retains this weapons configuration for Halo: Reach, Halo 4, and Halo 5: Guardians. The Type-58 35cm Directed-Energy Mortar (T-58 35cm DEM) is the primary armament of the Type-58 Wraith. The plasma mortar can destroy heavily reinforced defenses from a long distance while also proving effective in closer engagements, at least in the hands of a skilled operator. The heavy mortar cannon is attached to the rear of the Wraith. The Type-48 Light Assault Gun Carriage, more commonly known as the Revenant, is equipped with a smaller, less powerful variant of the Wraith's plasma mortar. The mega turret is a long ranged, stationary heavy plasma mortar used by the Covenant Empire, as well as certain Covenant remnant factions after the Human-Covenant War. The United Nations Space Command also used a type of plasma mortar, but it was in prototype form upon Rhinos which were used in at least 2531. Five of these were used by Professor Ellen Anders to collapse a Covenant energy shield and reveal a Super Scarab, a Covenant superweapon, during the Battle of Arcadia. In Halo Wars, if you play as a Covenant leader (Ripa 'Moramee, Brute Chieftain or Regret), you can upgrade your turret to a plasma mortar. This version of the turret specializes in taking out infantry (Grunts, Marines, Hellbringers, Jackals, Spartans and Hunters). The Covenant Air Artillery, a unit cut from Halo Wars, would have also used the Plasma Mortar. A Wraith firing its Plasma Mortar. A Plasma Mortar fires in an arc, so it is somewhat difficult to hit a target. The further away you are, the higher you will have to aim to actually hit your target. Timing is critical; if perfected, your shot may flip a smaller vehicle over, allowing you to launch a second mortar and obliterate the vehicle and the crew. Due to its slow speed and high visibility, the plasma bolt is much easier to avoid than a human projectile. Remember that even if you are behind cover, you may still not be protected from the plasma's curved trajectory. Plasma mortars are usually used for close range in Multiplayer, due to the difficulty of hitting people with the arc involved. In the Halo 3 campaign, the Wraith's AI is so skilled with the plasma mortar that it can hit you from very far away. Keep moving. When a Plasma Mortar is discharged, it makes a distinctive whining noise as if flies through the air. Use this to your advantage, and keep moving. Chances are, you will be able to completely avoid the shot with some deft maneuvering. On larger maps like Valhalla, if you continuously launch volleys toward the enemy base, you will eventually get a kill. You can also kill teammates, so be careful where the shots are placed. Plasma mortars may have been inspired by the Plasma Bugs in the film adaptation of Starship Troopers. In the Halo 3 Starry night trailer, plasma mortar bolts move faster than normal. During the level Quarantine Zone in Halo 2, several large plasma mortars can be seen firing opposite a couple of Sentinel Factory platforms, one plunging down, but it's never confirmed if these are from stationary plasma mortar cannons, or otherwise. However, due to the area containing the two Wraiths fighting Enforcers, and its close proximity with the destroyed remains of the factory, it is likely that they are the Wraiths' Plasma Mortars. It is even possible to see those same Wraiths fire at the remains of the factory, when the player destroys the Enforcers before the Wraiths are immobilized.